When Life Hands You Lemons-Don't Be Tossin' Those Peels! We Cook'n newsletter authors talk about lemons often-they're such a versatile fruit. But at the risk of boring you, I'd like to add one more article to the lemon pile. The subject? Tossing the lemon peels after juicing and zesting. Doesn't that feel wasteful to you? It always has to me. You get maybe 1/4 cup of juice out of one lemon, then the bulk of the fruit is tossed. How can that be right? 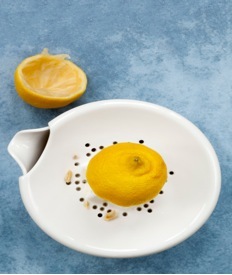 But wait, there's good news regarding this practice-I found it on one of my favorite websites, Care2: So hurrah-come to find out there are several ways to get the most out of lemons if you know how to reuse the peels! Now if you're thinking "Lemons, AGAIN? I know all about how to use them! ", please read on. You just might find an idea you hadn't thought of-ideas on how to make green cleaning products, beauty treatments, and even making your own lemon extract with those leftover peels. 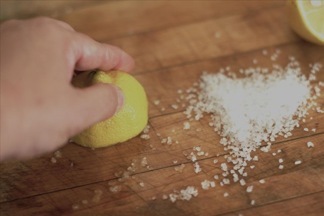 Cleaning Scrub - Dip half of a juiced lemon in a shallow bowl of salt to create an instant scrub for greasy or neglected pots and pans and kitchen counters. Since salt can be harsh on some surfaces, make sure you do a small test area before you go crazy with this scrub. 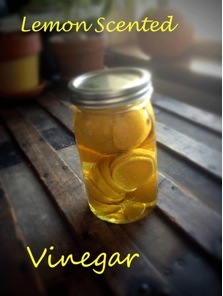 Vinegar Cleaner that Smells Good - Instead of mixing plain old white vinegar and water to make your all purpose cleaners, try using lemon peel-infused vinegar instead. 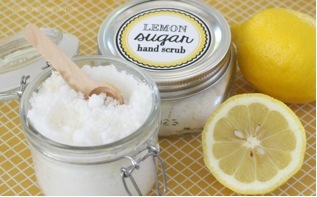 Rejuvenating Hand Scrub - Lemon juice, lemon zest, sugar and olive oil combine to make a lovely-smelling scrub for dry hands. 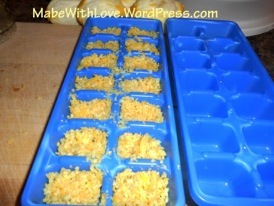 Stash That Zest - You might not need lemon zest now, but that doesn't mean you can't zest your lemon peels and freeze the zest for later! Just toss the zest into a freezer-safe container, and you can pull it out next time you're making a recipe that calls for zest. 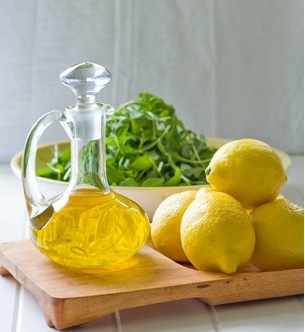 Clean and deodorize Your Cutting Board - Set aside that juiced half a lemon, and rub the cut side on your cutting board to kill bacteria and deodorize. Make a Cloved Lemon - Just like the cloved oranges you make around Christmas, a lemon covered in cloves will dry instead of rotting. Just make sure that you stick the cloves evenly over the whole lemon, then place it somewhere that needs a little bit of help in the smell department. 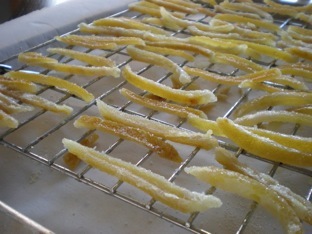 Candy Them - Candied lemon peels are super delicious! They take a bit of work to make, but if you have the time, they're worth it. Make Infused Olive Oil - Steep lemon zest in olive oil for a few days, and you've got fancy citrusy oil for salads or for finishing soups and stews. 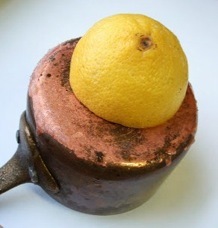 Make Lemon Extract - Store-bought lemon extract costs an average of $1.98 per ounce. Here's what the clever gal at www.mommypotamus.com found out: organic lemon peels were $.49/ounce, which she simply saved from all the lemons she used for other things. She used 6 lemons and vodka as her spirits for her batch of extract. 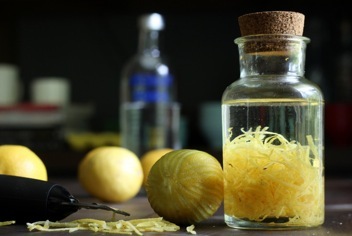 She poured her vodka into a jar with a tight lid and added her lemon peels then let the mixture sit in a cool, dark place for about 6 to 8 weeks. Voila-extract for a fraction of the price of store-bought stuff! Alice: Here’s Why You Oughta Make a Date with Dates! Camille: Homemade Fondant- Inexpensive and Tasty! Alice: When Life Hands You Lemons-Don't Be Tossin' Those Peels! Alice: Here's a Sure-Fire DYI Fruit Fly Trap! Alice: Let's Healthify at Least 1 of America's Top 10 Favorite Foods! Camille: Do YOU Know How To Put Out A Grease Fire? Need an Excuse to Eat Ice Cream?